on December 13, 2016, 9 a.m.
With the holiday season very much upon us, there seems to be no better time to enjoy the various festivities and events that the UAE has to offer. This is especially the case when it comes to the numerous sporting events that are hosted in the country; be it the Dubai Rugby 7s, the Abu Dhabi Grand Prix or the DP World Tour Championship, there’s plenty of sports to go around for everyone. 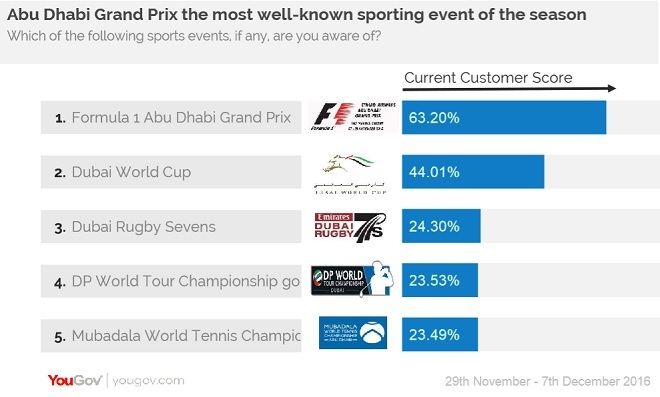 A YouGov Omnibus measuring the levels of interest in various recent and upcoming sporting events has found that the Abu Dhabi Grand Prix is the most well-known with 63% of respondents saying they were aware of the event. 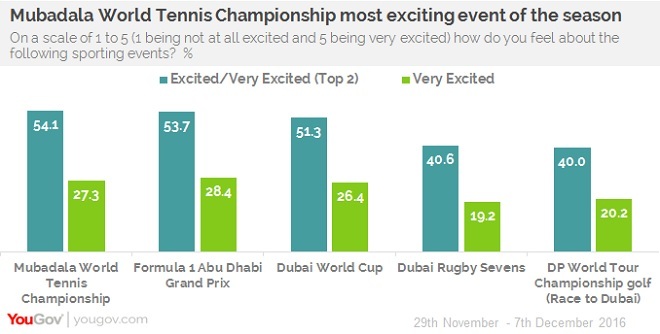 The Dubai World Cup was just behind in awareness with 44%, followed by Dubai Rugby 7s at 24%. Gauging the effect of these events on their main sponsors also provides some fascinating insight. 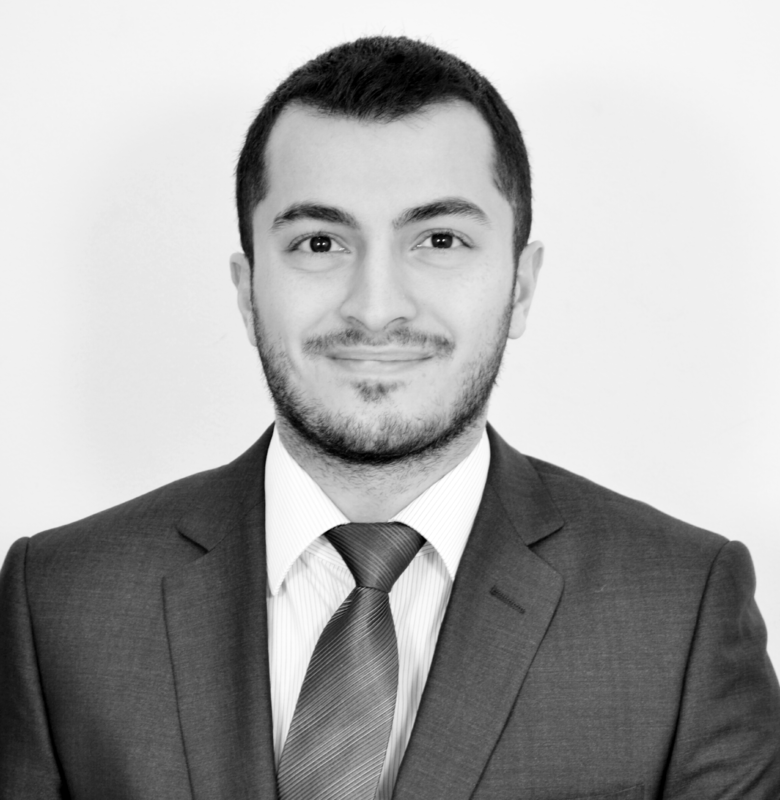 Focusing on Emirates (Dubai Rugby 7s) and Etihad Airways (Abu Dhabi Grand Prix), BrandIndex – YouGov’s daily brand tracker – shows a significant uptake for both brands’ Buzz score in the month leading up to their respective events. The BrandIndex Buzz score (which measures whether respondents have heard something positive about a brand) shows a 4.8 point increase in Emirates’ Buzz score, from +57.8 in the beginning of November, to +62.6 currently. 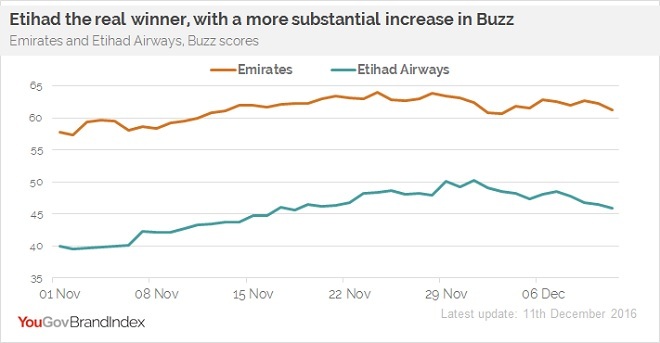 Etihad Airways’ Buzz score had a more substantial uptake, increasing by 6 points, from +40.0 in the beginning of November to +46.0 currently. Accordingly, it seems that the Grand Prix’s higher awareness and generated excitement have had a more noticeable impact for Etihad. That being said, considering the Dubai Rugby 7s’ lower awareness and excitement levels, this is still a considerable increase in Buzz for Emirates. Let us know what you think about these sporting events and more, in the comments section below.